Le Chateau des Palmiers is a world-class beachfront estate that includes a five bedroom ocean side villa and a four bedroom garden side villa. 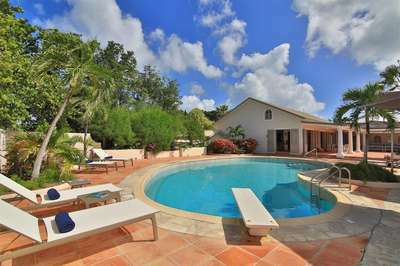 Situated on the white sand beach at Plum Bay, this fabulous property provides an intimate, relaxed and attentive environment within the walls of a gated enclave. The many amenities include a huge heated pool, an open air and air conditioned fitness center, a tennis court, and covered outdoor bar, billiards and dining areas. The ocean side villa features five king bedrooms with full private baths including a two-story master suite with a master bath with Jacuzzi tub and two private balconies facing the pool and ocean. The remaining interior spaces include a fully equipped kitchen, a formal living room, a formal dining room seating ten and a casual outside dining area and a media room. The four bedroom garden side villa features the Jungle Room with king bed and small living room, the Palm Room with king mahogany bed and a two bedroom suite with queen beds, a shared living room and cozy dining room. There is also a huge commercial catering kitchen. Other amenities include air conditioning in all rooms, an outdoor sound system and internet access. All bedrooms have independent TV receiver and DVD player, the media room and master bedroom have large satellite dish and DVD player. There is an onsite Chef and experienced security staff available along with a state-of-the-art security system. Enjoy the beautiful Caribbean sunsets from this stunning one-of-a-kind Chateau and experience the vacation of a lifetime.